Can Ethical Foie Gras Happen in America? The delicacy has been banned by some cities that believe it is produced inhumanely. Now a Spanish farmer is trying to bring his "natural" technique to the U.S.
Crouching in a verdant pasture in the early summer sun, Eduardo Sousa plucks a few blades of grass and extends them toward a flock of geese. "Hello, my darlings," he coos. "Hello, hello, hello." It is the Spanish farmer's first visit to the Stone Barns Center, a farm and education center dedicated to sustainable agriculture in Pocantico Hills, some 30 miles (48 km) north of New York City, and Sousa is impressed with what he sees. 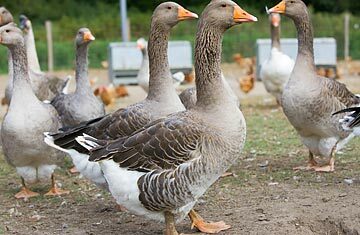 "If I lived here," he says, reaching affectionately toward the geese, "I could make some amazing foie."